Bank Nifty opened higher at 24141 and declined to register low 24032 but bounced back again by more than 250 points to register high 24293 and finally closed 133 points up at 24222. Yesterday, I mentioned Bank Nifty still has possibility to bounce towards 25198 in coming days and I suggested trade with condition that, “If Bank Nifty breaks 24253 within couple of hours (before 11:15 AM) then Bank Nifty 24100 Oct call can be bought on decline towards 24200-24150 using stoploss of 24129 expecting upside targets 24878-25198 in coming days”. Bank Nifty was trading above breakeven point 24253 at 10:10 AM (between 24253-24286) so our condition was satisfied and our 24100 Oct Call [buying range 24200-24150] was trigged. Now, we need to analyze latest chart to find next move. This is 30 Minute time bar chart of Bank Nifty covering move from low 23611. The corrective pattern seems completed at 23611 and new upside wave for high above 25198 may be in progress from 23611 (explained in my previous analysis report). 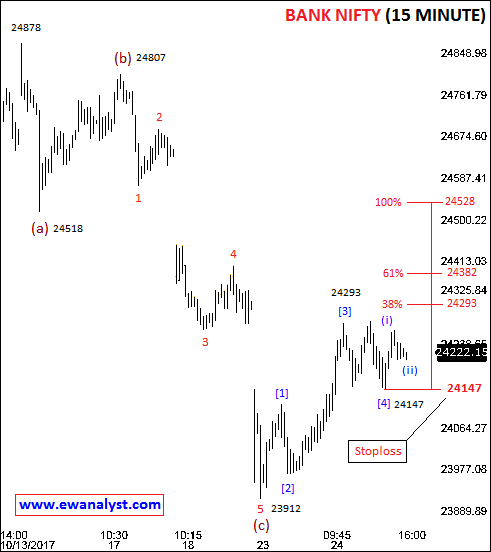 And within the bounce from 23611, It seems an impulse completed from 23611-24227 may be wave (A or 1), wave completed from 24227-23978 may be wave (B or 2) as an Irregular Correction and wave completed from 23978-24878 may be wave (C or 3). Now, we need to analyze decline started from 24878 on separate lowest possible time frame chart. This is 15 Minute time bar chart of Bank Nifty covering move from high 24878. It seems wave completed from 24878-24518 may be wave (a), wave completed from 24518-24807 may be wave (b ) and wave completed from 24807-23912 may be wave (c). The corrective pattern (abc) seems completed from 24878-23912 and new upside wave seems in progress from 23912 which may extend above new high in comings day’s/weeks. Within the bounce after 23912, it seems inner wave , , ,  completed till 24147 and next  may be in progress. Minimum 38%-61% for wave  is at 24293-24382 and next 100% is placed at 24528. So, 24293-24382 is minimum targets range on upside which further can extend towards 24528. 24147 (start of wave ) is fresh stoploss for longs and this stoploss will change to 24279 once Bank Nifty breaks above 25382. Bank Nifty broke breakeven point 24253 as expected and registers high 24293. Now outlook of Bank Nifty is bullish for immediate upside targets 24293-24382 which further can extend towards 24582. Otherwise this bounce can break above 25198 in comings days/weeks. Bank Nifty 24100 Oct 2017 Call bought in 24200-24150 range can be hold with fresh stoploss of 24147 expecting minimum upside targets 24293-24382 which further can extend towards 24528. 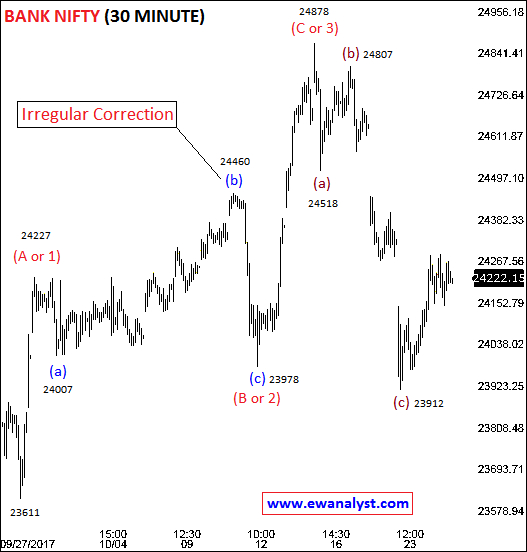 Modify stoploss to 24279 once Bank Nifty breaks above 24382. Please book/protect profit with trailing stoploss whenever seeing reasonable profit. Woah, I like your wave count they just impeccable. If the fall from 24878 to 23912 has already breached 24227 which is marked as 1 then its not an impulse cuz 4 cannot overlap with 2 and therefore it should be marked ABC only?